Anyone else catch those teaser ads by Budweiser featuring a black label against a golden amber background? Turns out Anheuser-Busch has two new beers rolling off its production lines in St. Louis: Budweiser Black Crown and Beck’s Sapphire. Why add two more beers to an already overcrowded domestic market? The simple answer is both labels need a boost and the hook is they’ve increased the alcohol content. 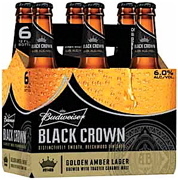 Budweiser introduced its Black Crown edition Monday, which offers 6 percent alcohol by volume compared with the usual 5 percent. I picked up a six-pack and tried it last night. It’s a bit like two beers colliding. The front end of Black Crown has a complex flavor, slightly woody, flavorful, with a more pronounced hops taste than a generic domestic beer, but lightens up on the backend, and finishes clean, much like a regular Budweiser. There is an awkward moment of transition between the complex start and clean finish that caused me to wince. It’s an imperceptible second on the tongue, but it catches slightly, and made me wonder exactly why this beer is being forced upon the market. Black Crown is the end result of a year-long selection process known as “Project 12.” Budweiser had its head beermakers at each of its 12 U.S. breweries come up with a unique recipe for an experimental brew. Six were selected for production, and after 25,000 taste-tests, Black Crown was the clear winner. The increased alcohol content is no joke. This is no “sit around the house and watch a game” kind of refreshment. It’s more of a club beer. Lights and music take a customer’s mind off the specific taste, and the higher alcohol content leads to faster intoxication. Black Crown is intended to build upon the success of Bud Light Platinum, which came out last January and also has 6 percent alcohol. The idea is to juice the Budweiser label after sales fell 7 percent domestically in the third quarter. Black Crown is designed to compete with the idea that the public is seeking a more premium brand of crafted beer as opposed to the traditional mass-produced bottles. At $6.75 a six-pack, Anheuser-Busch gets to offer another Bud product but at a slightly higher price point, yet a bargain compared to other green-bottled imports. Now before you think it’s odd that Anheuser-Busch owns Beck’s – flip that thought around. Four years ago the combined Belgian-Brazilian multinational brewing company InBev bought Anheuser-Busch for $52 billion, and merged it with the company’s labels creating Anheuser-Busch InBev (AB InBev). This behemoth is the world’s largest brewer, with nearly 25 percent of the global market share. Its labels include Beck’s, Budweiser, Busch, Corona, Hoegaarden, Michelob, Natural Light, Spaten, and Stella Artois. 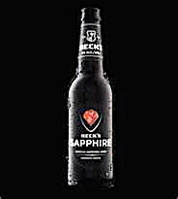 Beck’s already is the most popular German beer, and releasing a version with increased alcohol content does nothing for the brand overseas where brews have always been stronger, which is why Sapphire is only for sale in America. Both new beers are getting posh treatment from Madison Avenue in terms of advertising and packaging. Watch for their official unveiling during the Super Bowl on Feb. 3, where over 112 million thirsty consumers will be watching. But with these two new releases, it begs the question of how many beers can sit on the shelf at once? It seems there are 10 new IPAs or micro-brews every time I walk in a liquor store. These new entries have to take shelf-space away from something. Removing that Bud Lime would be a good place to start. This entry was posted in Food and tagged AB InBev, Beck's, Beck's Sapphire, Budweiser, Budweiser Black Crown. Bookmark the permalink.